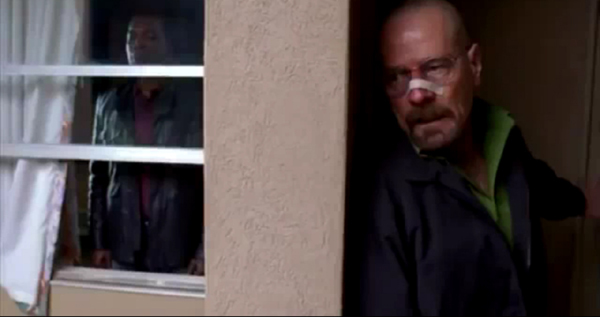 As I’m sure many of you did, I spent yesterday evening watching the season finale of Breaking Bad. As season finales go it was one of the great ones, not least because it managed the often difficult trick of concluding a long and suspenseful narrative arc without either seeming too neat and convenient or fumbling the ball at the last moment. But it also contains one of the most gruesome – and the most exhilarating – scenes I’ve seen on television in a long while. What follows is going to be at least technically spoiler-free, since I’m not going to describe the scene, but if you’d like to go into the episode completely free of information you should look away. But basically it’s a moment of sudden and surprising violence involving one of the central characters. The scene was interesting to me for a couple of reasons. One was how brilliantly orchestrated it was. Despite all the scheming and mind games part of the strength of this season of Breaking Bad has been the growing sense of chaos surrounding Walt, and the manner in which his actions have disrupted the operations not just of his family but Gus and the cartels in increasingly dangerous and unpredictable ways. Certainly it’s been difficult not to be aware of the steady escalation of the risk to Gus and his operations as the DEA (or at least Hank) gradually became aware of the possibility that Gus might not be quite what he seems to be. Yet as the final episode revealed, the season has also been incredibly tightly plotted, not just in the narrow sense of Walt having a plan, but in the larger, narrative sense of tracing out arcs and story lines that converge in a manner that’s both inevitable and surprising (to borrow Cocteau’s formulation). But what also struck me was the sheer delight of the moment I’m talking about. When it came I quite literally jumped in the air and cried out, not once but twice. And despite the absolute horror of what had happened my reaction wasn’t disgust, it was exultation. It’s a reaction you only normally get in dramatic forms like film, television and theatre (although there’s a scene in Deborah Moggach’s novel, Tulip Fever, which tends to generate the same response). There are several such moments in The Sopranos (Tony picking the tooth out of the cuff of his pants while talking to AJ’s psychiatrist, Paulie’s mother’s friend catching Paulie in her house, Ralphie’s head falling out of his toupee), but there’s also the lawnmower scene in Mad Men and any number of such scenes on film (oddly the one that come to mind immediately is the moment the shark grabs Samuel L. Jackson in Renny Harlin’s Deep Blue Sea, but there’s also the much-imitated scene in Raiders of the Lost Ark in which Indy shoots the swordsman by the plane). What’s fascinating about all of them is that they’re moments in which the violence or grostesquerie comes as a surprise, and is often designed to elicit something like humour. Yet the sort of surprise they depend upon is often one that goes beyond the surprise that comes with the revelation of something unexpected: instead it’s the sort of surprise that subverts our expectations about the conventions of the genre. We don’t expect that shark to grab Samuel L. Jackson in Deep Blue Sea because he’s in the middle of giving the big “we’ll fight them on the beaches” speech every action movie needs (and the fact Jackson is a big star and a major character). Likewise the lawnmower scene in Mad Men doesn’t just involve the eruption of violence in a show that’s largely about the workplace, it involves the maiming of a character we’ve been led to believe will be significant. And while the scenes in The Sopranos are less overtly subversive, they exist within the framework of a show which often used violence to remind us of the randomness and chaos of the world as a whole. But they’re also fascinating because they’re not just about doing unexpected or unpredictable things. Just maiming people at random simply doesn’t work as storytelling, however subversive it might seem. Whether it’s the scene from last night’s Breaking Bad or the shark chomping on Samuel L. Jackson, such scenes tend to jolt our expectations and assumptions within the narrative as well, by revealing the plot is not quite (or not at all) what we’d been assuming. It’s this part of the process that’s particularly tricky. The director of In Bruges, Martin McDonagh, is also a playwright, and the author of a series of remarkable (and remarkably violent) plays which depend at least in part upon eruptions of violence that are at once shocking and hilarious. Of these the second in his Leenane Trilogy, A Skull in Connemara, is particularly interesting. The plot centres on a gravedigger charged with clearing out an overcrowded graveyard, and involves a subplot about his murdered wife, although as becomes clear later on, none of this is really the point. Instead the point is the bones – and more particularly the skulls – the gravedigger keeps accumulating, and the question of what is to be done with them, a question that’s answered very graphically towards the end of the play when, in an explosion of violence, the gravedigger begins to smash the skulls to pieces with a mallet. It’s an extraordinary scene, and an incredibly liberating and exhilarating one. The sheer anarchy and release of it is hard to describe. But part of what makes it so exhilarating is precisely that sense of release, of knowing, at some intuitive level, that whatever you may have assumed this moment was the point all along. The scene in last night’s Breaking Bad shares this quality, because it’s also the moment you realise things have not been what you’d assumed. Yet by releasing the tension that’s built up over so many episodes in such an unexpected way, it transforms something that should be horrible into something that’s exciting and even grotesquely funny. Anthropologists talk about liminal moments, points in time when the assumptions that govern our interactions are suspended, and we enter a state of possibility, and change, and I suspect that beneath the gruesomeness there’s an element of that at play in these moments too, a sense in which the ordinary rules are suspended, and we glimpse something of the possibility of change and transformation that is embedded in the heart of all narrative. And, paradoxically, where our extremely sophisticated awareness of the cultural conventions of genre and narrative (because without that awareness the subversion couldn’t work) also makes it possible for us to encounter the most uncritical feelings of wonder and release that narrative depends upon.